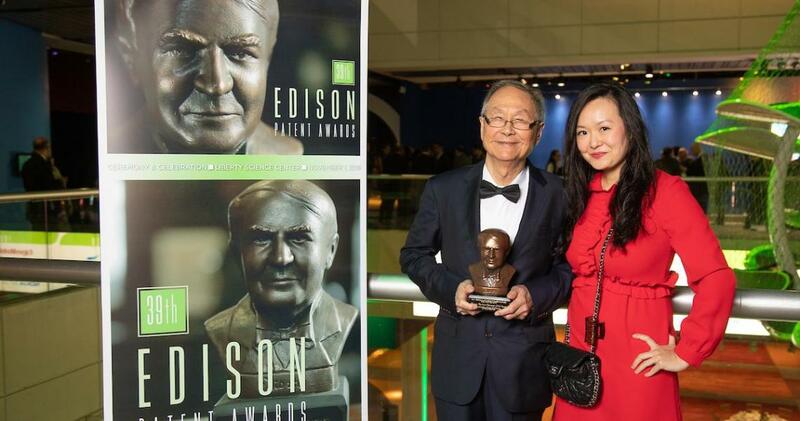 NJIT Physicist Ken Chin and his daughter, Iris, at the 2018 Edison Patent Awards Ceremony. Physicist Ken Chin, a scientist, author and inventor, received a Thomas Alva Edison Patent Award last night from the Research & Development Council of New Jersey for his work on a promising new method for advancing sustainable energy production: next-generation solar cells. Chin focuses on improving the performance and efficiency of thin-film solar cells based on cadmium telluride (CdTe), which are potentially a lower-cost alternative to silicon because they require fewer natural resources to produce electricity and take up much less space on buildings. “What we’re interested in is low-cost mass production,” noted Chin, a professor of physics and director of the CNBM New Energy Materials Research Center at NJIT. His group has developed important insights into the physics of the photoelectric behavior of cadmium telluride, which suggests that new manufacturing conditions could produce much higher cell efficiencies. His patented invention, “P-Doping of CDTE Polycrystalline Thin Film Based on CD Vacancy Theory,” is a process for enhancing the material’s ability to convert sunlight into electricity. While CdTe-based solar cells have a theoretical conversion efficiency limit of about 29 percent, they have yet to achieve it. “We also want to ensure that this material, which is essentially a semiconductor, works predictably,” he added. Fifteen organizations, along with 61 inventors, were recognized last night at the R&D Council’s 39th awards ceremony, held at the Liberty Science Center. NJIT’s Rajesh Davé, a particle engineer, also ascended the platform at the awards ceremony last night as a core member of The Center for Structured Organic Particulate Systems, a cross-disciplinary group of university researchers and private sector partners such as Janssen who work closely with industry leaders and regulatory authorities to improve the way pharmaceuticals, foods and agriculture products are manufactured. The Center, headed by Rutgers University’s Fernando Muzzio, received the Chairman’s Award for its innovations in advanced manufacturing methods. Two years ago, Davé, distinguished professor of chemical, biological and pharmaceutical engineering, and two of his former graduate students, Maxx Capece and Daniel To, received an Edison Patent Award for developing a manufacturing process that masks the bitter tastes of medications while delivering them effectively to their targets in the body.